Apple Pomegranate Salad is a beautiful but simple to make, fruit salad with apples, marshmallows, and pomegranates mixed with sweetened whipped cream and topped with more pomegranates. I love a good fruit salad! They are easy to make, the perfect healthier dish for parties and so pretty too! You all know how much I love my Cranberry Salad. We have it every Thanksgiving and Christmas. My sister-in-law was telling me how her family makes a similar salad using apples, marshmallows, and pomegranates mixed in the salad. She didn’t have a recipe so I based this Apple Pomegranate Salad off of my Cranberry Salad and it turned out amazing! 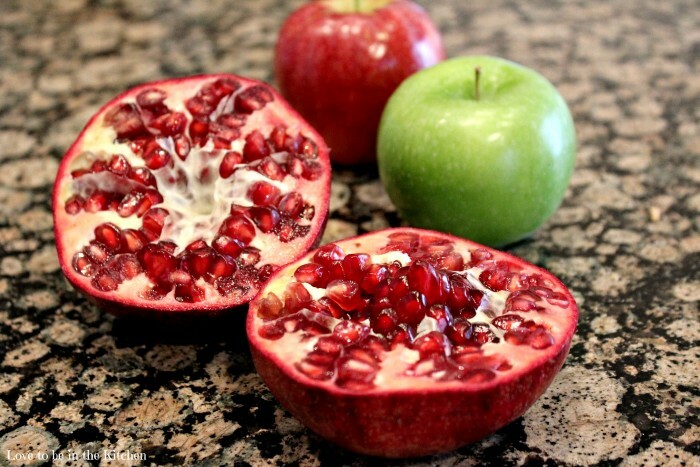 You know a recipe is going to be good when it started with apples and the always beautiful pomegranate! 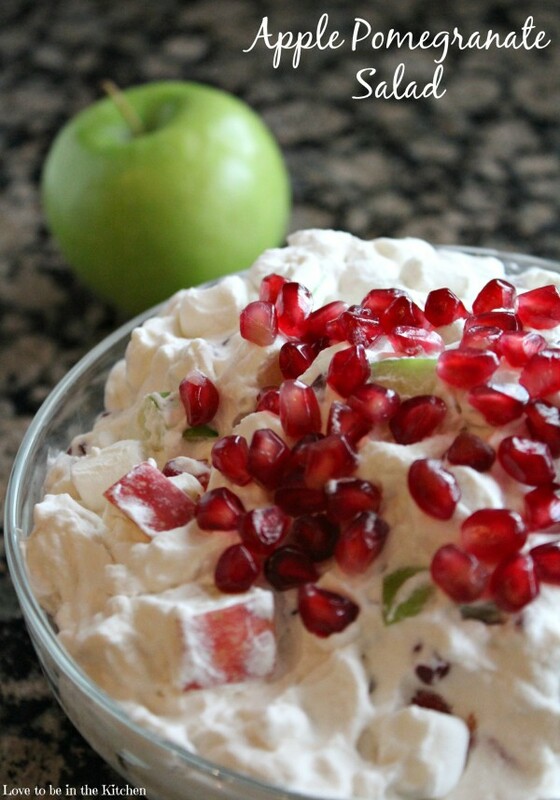 To make this Apple Pomegranate Salad all you do is whip up the whipped cream, add a little powdered sugar and vanilla. 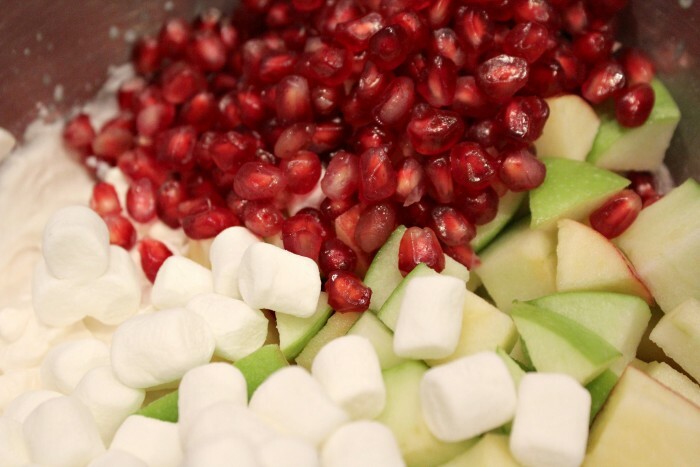 Then mix in the chopped apples, pomegranates, and mini marshmallows then top with more pomegranate seeds. That’s it! Feel free to use whatever type of apples you’d like. I used granny smith because I love the tartness and I also used Gala. I made this for my family Christmas party this past Sunday so I was also going for the festive Christmas colors with the red and green apples. 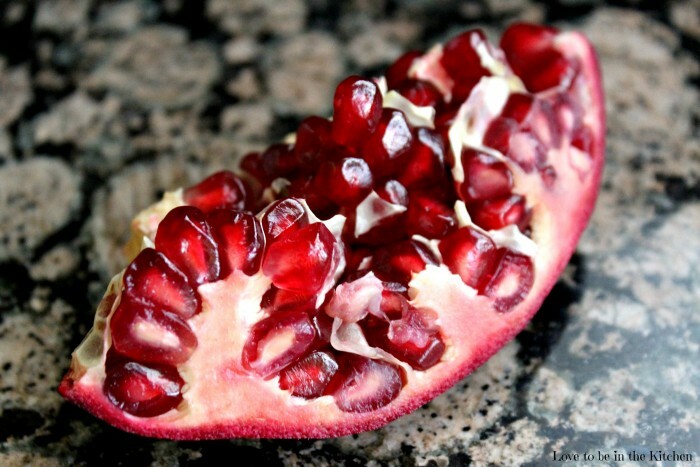 And of course, the beautiful red pomegranate seeds make it even more festive and pretty! Whip the heavy cream in a large mixing bowl (using a stand mixer with the whisk attachment or handheld mixer) until it begins to thicken, about 1 minute, and then beat in the powdered sugar and vanilla until soft peaks form about 3 to 5 minutes. Gently fold in the chopped apples, and about 1 cup of the pomegranate seeds and mini marshmallows. Transfer to serving bowl and top with more pomegranate seeds.